A rare find for artisans and crafters alike! 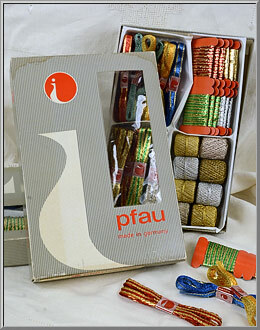 Manufactured in Western Germany more than 60 years ago, this deluxe boxed set includes four different styles of metallic trimmings. 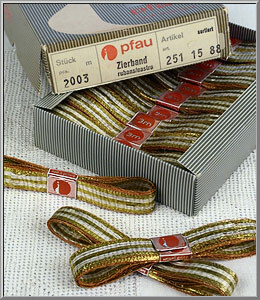 Produced by 'Pfau' (German for peacock), the Lahnband hanks have embossed metal closures with their logo and "Made in Germany." 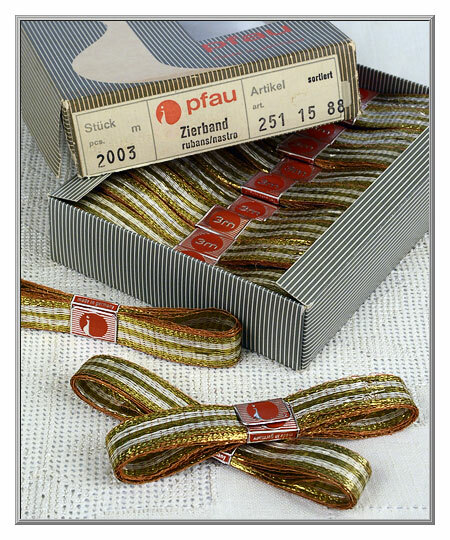 The set has 46 pieces of old-style ribbon and cording. Condition note: the boxes all show signs of water damage, but the product inside is still in clean, like-new condition. over time, while the real silver plated Lahn is "guaranteed to tarnish". 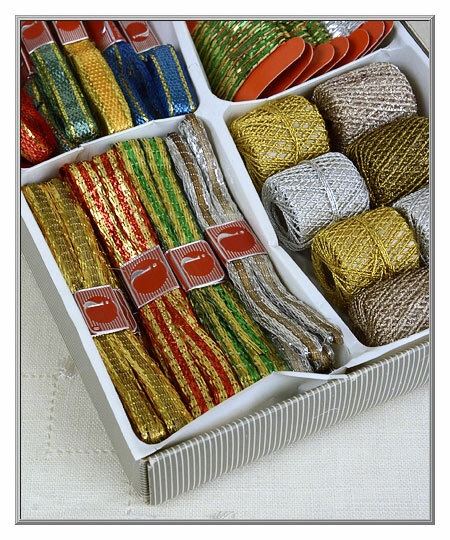 This luxurious Lahnband ribbon is quite elegant! Designed with a close attention to detail, the gold Lahn used has two different embossed textures, while the silver plated Lahn was stamped with a miniscule dotted pattern. 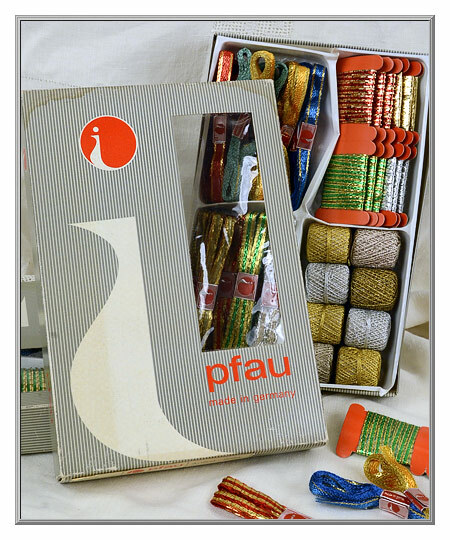 Mint condition ribbon has a metal closure with the 'Pfau' peacock logo and "Made in Germany." Sold as one hank of ribbon. 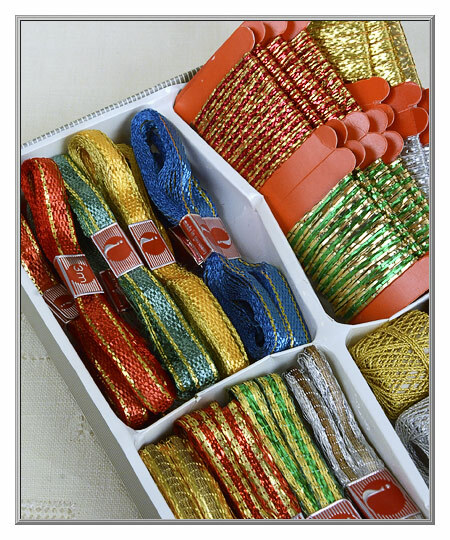 of 5/8" wide metallic ribbon. 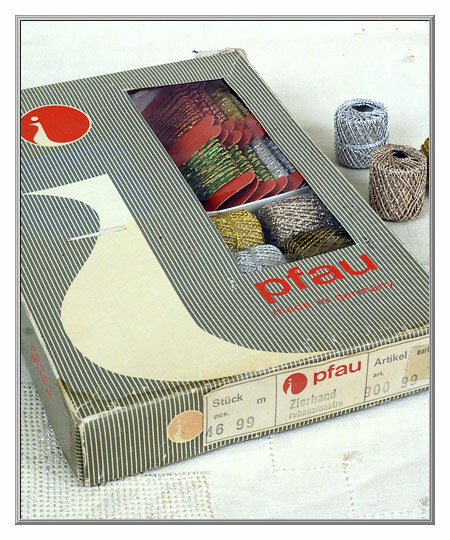 This extra-fine cording was produced in Austria in the 1980's. 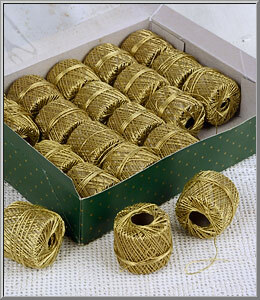 Old stock that we had stored in our archives, the cording is made of shiny gold metallic Lahn that is twisted around a cotton thread center. Sadly, the firm that produced this trim has closed its doors, so this is our final offer of this old-style craft cording. Sold as one spool of cording. 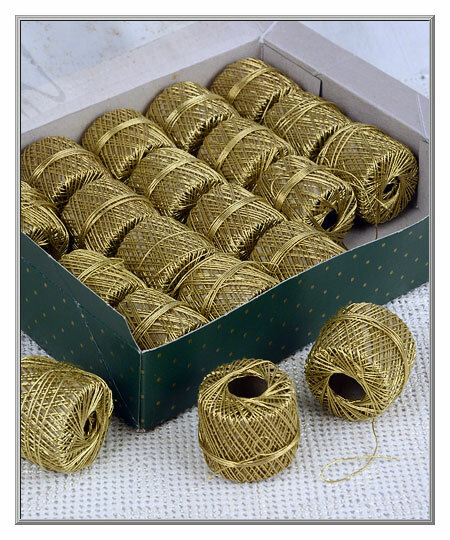 of fine, 1/32" wide gold cording.